Translation:She is in the shower. Guys, we are learining Polish here, not English. The English phrase "she is under the shower" translates the literal meaning of how Polish people say it, it makes you REMEMBER the Polish phrase. I bet you'd have harder time memorising the phrase if not for this seemingly erroneous translation. Just try to split the notion of "shower" in your head. It's a shower-place with a shower-head giving out shower-water. For English speakers the default meaning is the place and the water (IN which you are), for Polish it's the shower head with the water (UNDER which you are). She is under the shower is the same thing. It is not. It is incorrect or it implies they are under the floor of the shower. OK, she is in the shower, but in English she can be under it as well. If she's in an open shower room in a gym, then she is under one of the shower heads and not IN the shower at all! We already agreed one can be under a showerHEAD. Not a shower. I agree. We need, however, one word in Polish which means 'in', like 'w' and one which means 'under', such as 'pod'. Sadly, 'pod' can mean in, under or even at, as in ' mieszkam pod 8 ul. Glowackiego. Yeah, I decided to put it back. I never liked the decision to remove it. after reading the comments, why is it still "pod" and not "w" if it was changed to "in the shower"
Because this will not ever be said. You can be "w kabinie prysznicowej" (in the shower cabin), but absolutely not "w prysznicu". That's physically impossible unless you are Ant-Man and can really, literally fit inside the device. As you've seen, I inclined towards leaving "under the shower" as a literal translation, but the arguments against it were serious enough. So we shall treat it as one of those common situations when the languages just use different prepositions. The translation is incorrect. It can be "she is in the shower" or "she is taking a shower"
The phrase "under the shower" is definitely used in English to mean the same thing, so all 3 should be considered correct. I don't want to downvote you, but I am willing to bet real money that no native English speaker over the age of three has EVER said they're "under the shower". If we're talking about the sensation of a shower outside of your bathroom, like a rain shower or being showered by droplets from a car passing over a puddle, it's "in a shower" or even more likely "caught in a shower". Never have I ever heard "under the shower", but "under the showerhead" would be perfectly valid. I wasn't aware that this phrase isn't considered proper English, or that it's so rarely used in the wider English-speaking world, so I'll accept that it may not be an appropriate translation to mark correct here. However, it is a phrase that is said by native English speakers to mean the same thing. Most often I've heard it said to describe the act of getting under the actual spray of water, as in "She's getting under the shower now", "I was just getting under the shower", "Hurry up and get under the shower", and so on. It's closer in meaning to "taking a shower" than it is to "in the shower", because you can be in the shower without taking a shower. Out of curiosity, where do you live where people say this? The dialect I grew up with is fairly distinct, but this is the first I've ever heard of anyone saying that aloud. I've been through 2/3rds of the USA and grew up with several people from south-central England. I'm from Australia but because we get a lot of international media (e.g. television) it's hard for me to recall whether I've heard it locally or from elsewhere. It's not a common thing, but rather an acceptable variation of the same phrase. Based on what I have seen, "She is under the shower" is a regional idiom from places in the UK -- definitely not U.S English. 'Under the shower' is most definitely possible in English, and was my first answer, because it seemed more literal and also is used in English. Imagine the doctor has prescribed some kind of special shampoo for you. The doctor could - would probably - say, 'When you are under the shower, get your hair completely wet and then apply the shampoo,' for example. More than 25 years as an international teacher of English and with two degrees in literature - I've definitely come across this in the US and in books over the years, though I think it's not very current now. 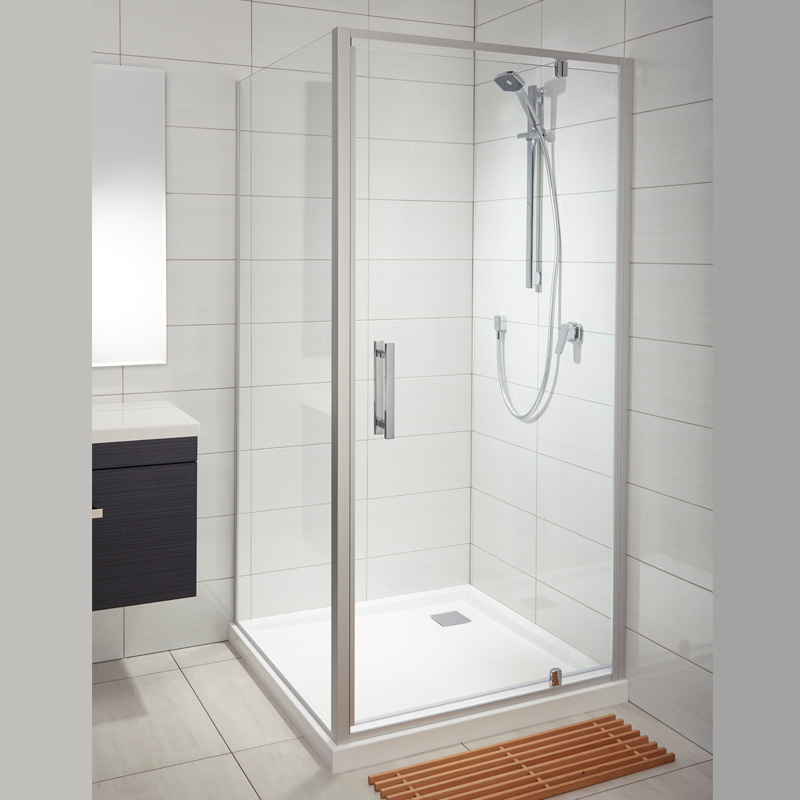 It may be more current in places where freestanding shower boxes are not common. It would be the obvious thing to say when showers first became common for washing. One is 'in the bath' because one gets 'in' the tub, 'in' the water. But originally, one would stand 'under' the shower of water - the natural way to think of this novel way of 'bathing.' In time, with enclosed shower cabinets (rather than shower heads in bathtubs). one would have more of a sense of being enclosed in the 'shower box' so to speak. Hence the proliferation of 'in the shower' rather than 'under' it. A clue to these things is that there is a logic in other languages saying - and staying with - 'under' the shower. Especially when you consider that in Poland, most 'showers' are still just a shower head on a long hose mounted to the taps in the bathtub. Freestanding shower units are only becoming more common in the past 10 years or so in Poland. So they retain the early sense of standing 'under' a shower of water, a sense that has faded - but still exists - in English. Don't make that bet, you would lose. Being "under the shower" is a very common way to say it here. under the shower is definitely not a valid translation and no one, not in any dialect at all, would ever say that in english. cue pondering of the existential implications of taking* a shower. still, "she is taking the shower" is not yet accepted. I agree it should be accepted. Taking a shower, having a shower, in the shower, under the shower; they all mean the same and are used interchangably where I'm from. "under the shower" is both perfectly acceptable and in use in British English, at least. Completely agree with mishio. All those expressions can be and are used. Since the whole point is to practice prepositions, and there's no preposition in 'she is taking a shower,' no reason for that to be offered as a possible translation. People have to work out that when they're being tested on a particular part of speech, true answers that don't include that part of speech won't be marked correct. But then I speak as a teacher of (English) teachers, so to me that's obvious. Nobody would ever say that in English, but it's correct in that it's the literal translation. I'm very quickly learning that words are utilized in pretty different ways than I'm used to, in this language. "She is under the shower" does NOT work in English. It doesn't make sense to accept the literal translation. What you put as a picture of a shower is "kabina prysznicowa", that is a place where the shower is. Its 'floor' is called "brodzik". "Prysznic" is the device as a whole, "showerhead" specifically is "słuchawka prysznicowa". This whole debate confused the hell out of me until I got back from Poland! In the USA, the taps and the showerhead are seen as completely separate, since what connects them is installed behind the wall and unseen almost all of the time. Every shower I saw in Poland had the showerhead attached by a flexible tube, coming right out of the taps, so I can totally understand the whole apparatus having one word. Dangit, now I miss Poland's superior bathroom fixtures... My host's shower even had bluetooth speakers in it! "Słuchawka" to me suggest you should hold it to your ear. I guess the shower was introduced (or rather became common) after the phone and was therefore named after the part that it looked like. This might be some regional difference, I think.
? Are Danish showers special? Admittedly bathroom standards is not on par with the countries around it but so much so that you have noticed? Nobody can accuse Denmark of being perfect. I only used two showers there, but both were bad. One in Kolding and one in Copenhagen. Neither had a door, though one had a curtain, but it meant I got the floor wet and the draft made sure I was instantly cold whenever the water wasn't hitting me. I guess no country can be perfect. Denmark is expensive and has crappy showers. Otherwise, it might be perfect. It will not be a suggested answer anymore, but as you can literally be under almost anything: a shower, a bed, a car, a dead crab - we have to accept it. You should accept "under the shower". It is normal to say it that way in some places. There is even a painting by a famous artist called "Woman under the shower" in an Australian State art gallery. Duolingo can't accept all dialects. In fact, this is meant to be American Standard English. I don't ask Duolingo to add words from my dialect (tator, commode, poke, etc). If we looked at ALL dialects, nothing would be wrong! But that isn't what it means. In Polish, would you be able to say something is literally under the shower, as in under the floor that you stand on in the shower, the exact same way as you would say to take a shower? I think even if it was grammatically correct, it would have to be emphasized, either through tone, other words, or some very clear context. Just because it is the literal meaning doesn't mean it should be an accepted translation. I think our goal is to learn to naturally speak language and this translation is not natural. Since I have started to do another Duolingo, I have realized that a lot of these unrealistic translations make it more confusing here, not less. I don't think these unrealistic translations should be accepted. Not 'under the floor of your bathroom', of course, that would be a little bit absurd. Okay, if that's really THAT bad, then I guess it's time for me to stop being stubborn. Deleted the answer. If you want a literal translation, "She is under the showerhead" would work. Completely unnatural (except for rare scenarios), but it would work. Because it is unnatural, I suggest making it a hidden solution rather than a recommended solution. Note that showerhead may be spelled "showerhead" or "shower head." A quick Google search seems to imply that "shower head" is more popular by a margin of about 2:1, but I guess this is probably regional. Clearly, you are often under the latter, and VERY rarely under the former. The shower is the floor, the doors/walls/windows, and everything up to the top of what is distinctly part of the shower, then you have your "invisible lid" (if it is not to the ceiling). Also, it is important to recognize that prepositions are not something that can really be "literally" translated between most languages. Polish "na" is more often "in" than "on," at least in my experience. "Pod" here simply means "in" in English. This is a common problem between English and Polish: prepositions are very difficult to translate and understand. Translating any proposition without a context really makes no sense. If you said this in Polish, could it possible mean in some context that you are actually under the floor of the shower? If not, then it isn't even translated literally, it is just translated word for word, which makes no sense and rarely works in language translation. From what I've seen, almost everyone here says this translation is wrong. One even has 12 up votes. "Pod prysznicem" means here that the woman is under water flowing from a device for bathing. And the device does not necessarily has a cabin. That's why your translations are grammatically correct in English but none of them is identical with the meaning of original phrase (and I don't really know what is the best match). The problem is that the example doesn't help to understand a meaning of "pod" in Polish. Americans can't spell colour, can't say alluminium. Still feel they can tell people how to talk English... I'm glad the original translation stands. Because each preposition is followed by different cases (genitive, locative, etc), which one will follow this preposition? Does "pod" for in/under here have any relation to the Latin root "ped;" related Greek root "pod," both meaning "feet?" Or is this just a complete coincidence, etymology-wise? Wiktionary claims: From Proto-Slavic podъ, from Proto-Indo-European h₂po + dʰh₁-o-, so it seems to be just a coincidence. Jellei, yes, it seems to be that way. I'm Russian, and we have the word "pod" with the same meaning. It is an ancient "proto" pretext that has existed so long in Slavic languages that the exact origin is unknown. But etymologists see it in the ancient Slavic. I simply have seen while using this application that some of the translations are just little bit weird. But the problem is English language not Polish. 'She is taking a shower' is (I think) the most natural Australian english translation for someone washing themselves under the shower. Well, but that already changes the verb from "to be" to "to take". Your answer directly and literally translates to Polish "Ona bierze prysznic". I wrote 'she is taking shower', is it wrong? Is instrumental case for shower because it follows "pod" or because it follows "ona jest"? The only reason for that is because pod requires instrumental. When do i use: on, ona, jej, go, tamtego, tamten, tej,tego, jest, and to. "To nie jest nasza flaga."